The DSM-V, the standard classification of mental disorders used in the United States, is considered by many to be the bible of the psychiatry world. Its descriptions of mental illness provide guidance to clinicians and insurers on diagnosis and treatments. But the manual has also been criticized over the years for its categorical approach to mental disorders, for symptom lists that are too strict or not strict enough, and for its many iterations and revisions. In her new book The Power of Different: The Link Between Disorder and Genius, psychiatrist Gail Saltz adds her own critique to that list. Saltz asks what if what the DSM—and by extension the society—considers brain disorders are actually brain differences? “It’s arguable that what we call mental disorder—as if it were an aberration—is in fact a natural part of our diversity as a species,” she writes. Dr. Gail Saltz joins Ira to discuss her thoughts on creativity abilities and the many categories of brain difference. Gail Saltz is the author of The Power of Different (Flatiron Books, 2017). She’s a Clinical Associate Professor of Psychiatry at New York Presbyterian Hospital in New York, New York. SPEAKER 1: This is Science Friday. I’m Ira Flatow. The Diagnostic and Statistical Manual, the famous DSM, is a tool that psychiatrists use to help diagnose and treat mental illnesses. It divides them into categories like major depressive disorder, autism, bipolar disorder, dyslexia. Each one describes the way in which something is abnormal about a person’s behavior, as if something has gone wrong with the wiring in their brain. Well, that approach to mental illness, right versus wrong, normal versus abnormal, doesn’t sit well with my next guest. In her latest book, she recasts brain disorders as brain differences, ones that come with some tough challenges but also unique abilities. 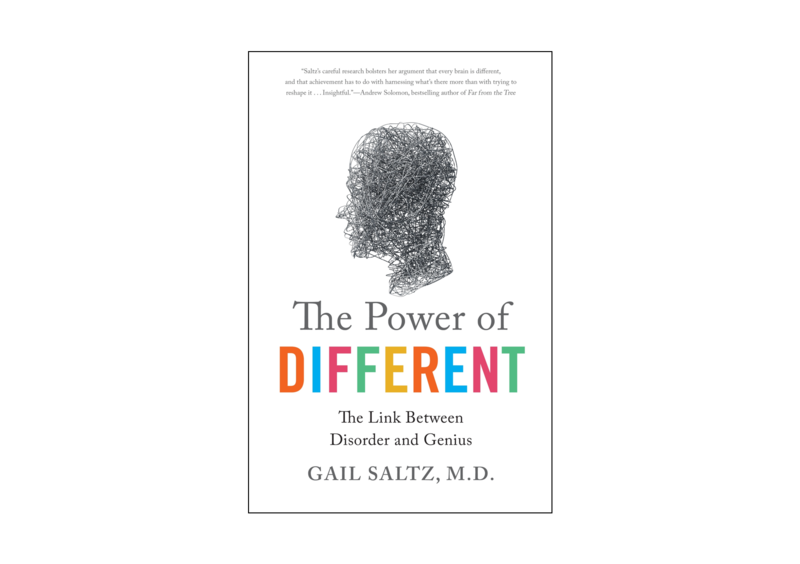 Gail Saltz is a clinical associate professor of psychiatry at New York Presbyterian Hospital, author of the new book The Power of Different, The Link Between Disorder and Genius. And she joins us in our New York studio. Welcome to Science Friday. SPEAKER 2: Well, thank you so much for having me. SPEAKER 1: You described disorders as brain differences. How is that different than a normal description? SPEAKER 2: Well, currently I think, a, we categorize based on behaviors, a group of behaviors. We say this is a reflection of a disease that causes suffering and that is true. But we categorize it in very discrete boxes to the best of our ability. I mean, the advantages of doing this, the reasons for doing this have to do with talking to insurance companies, for clinicians to talk to each other to think about prognosis. But unfortunately, those boxes don’t really fit. And clinicians, in truth, most clinicians when they’re treating people, are really treating symptoms. And we don’t know for certain what each of these symptoms means in terms of wiring in the brain. And actually, what it may turn out to be and it’s looking like from lots of projects that are ongoing right now in terms of MRIs and looking at the brain is that there is a tremendous variation in wiring in the brain. We all, to some degree, have differences. And it’s a matter of how different the difference, is if you will. Whether you are going to be suffering symptoms as a result of that. But what I also think it’s important, because stigma related to these diagnoses keeps people from getting treatment, from even acknowledging what’s going on and also from knowing that the very different that may be causing you suffering is also correlated to a very particular strength depending on what that suffering difference is. SPEAKER 1: Give me an idea, for example. SPEAKER 2: For example, people with dyslexia may really struggle in school with reading and suffer as a result. But they also likely have a very particular strength in spatial relations ability, visual spatial abilities, in pattern recognition, in perception on the periphery of their vision. There are very particular things that lend themselves to extraordinary strength. For example, I profile in the book a Dr. Beryl Benacerraf who is a physician with pretty severe dyslexia that really has caused her struggling. But at the same time, her ability to see on x-rays certain things that other people really cannot see as a result of these visual spatial abilities means that she went on to discover how one can diagnose Down Syndrome in utero by ultrasound. That is her discovery, a huge contribution to the field, really because she has dyslexia. SPEAKER 1: And the same might be said for people with autism or people with bipolar? SPEAKER 2: Correct. So specifically in autism, not to diminish the suffering, because it’s substantial, but for people, for example, with mild to moderate autism, what is perseveration and a problem sometimes behaviorally means a repetition of certain things with an exactness of that repetition that makes them able to do certain jobs, certain tasks better than people that don’t have that. And they also have something called hypersystemization, the ability to fit things into categories, classify objects in a way that, again, think Steve Wozniak, allow them to do things better than people who do not have this issue. And yes, that’s true of various mood disorders, anxiety disorders, you know, attentional issues as you brought up. SPEAKER 1: Mm-hmm. And is it possible, like we say people with autism have a spectrum disorder, is it possible that all of the disorders are sort of a spectrum? They range along and then we just put them in one big box. SPEAKER 2: So yes. First of all, it’s going to turn out to be that these big boxes are going to be many boxes, if you will, that there are going to be many disorders that are autism. However, it is also true, and I think this brings up an important point, all of these diagnoses are really, in a way, normal behaviors that have moved so far out on the continuum as to impair functioning. So guess what, Ira, we all are sad sometimes. We all are anxious sometimes. We all have better or not as good social relating abilities at times. But when it becomes more extreme and impairs functioning, that’s when we start to call it a quote “disorder”. SPEAKER 1: Mm-hmm, talking with Gail Saltz author of The Power of Different: The Link Between Disorder and Genius, in case you joined us late. You say it’s not a coincidence that many people with creative abilities also have these differences. What research is there to support that? SPEAKER 2: Yes, well it’s really fascinating. First of all, it’s important to understand I am talking about and the data talks about this u-shaped curve, the idea that if you have something very severe on one end of the curve, you might not manifest these things because probably you’re impaired enough that even if you have it in your mind, in your brain, you might not be able to show it or organize it well enough to make it come to fruition. But for mild to moderate on that u-shaped curve, yes. The data show, for instance, in the arts and in the sciences, but particularly in the arts, in music, in writing, etc, there’s a very high preponderance of extreme creativity. It’s not to say that people who are quote “normal” can’t be highly creative, they often are. But it is to say that people who are actually mild to moderately quote “mentally ill” have a higher likelihood of being highly creative than people who don’t have a mental illness. And I think that’s really important. If you look back in time at the iconic geniuses of history, the Hemingway’s, the van Gogh’s, the Abraham Lincoln’s, the Albert Einsteins, you will have a hard time finding someone who did not have a mental illness or a learning disability. SPEAKER 2: You wouldn’t have any. I mean, it really is striking. And scientists don’t like to talk about striking in anecdotal things. And I agree with that. But the correlations are quite high. And I think we, in a way, we don’t yet have the science to explain it all. But it is clearly, clearly there. SPEAKER 1: All right, let’s see if we can go to the phones. Let’s go to Rene in Cleveland. Hi, Rene. SPEAKER 3: Hi Ira, how are you? SPEAKER 1: Hi there. Go ahead. SPEAKER 3: I was wondering, as a high school teacher, what are some ways that I can help my students who already feel so stigmatized by diagnosis to help them understand that it’s not necessarily the end of the world for them to have dyslexia, for them have a learning disability. You know, what tools do you have to offer me, to offer my students to help them through that kind of thing? SPEAKER 2: Thank you so much for asking that question, something I really address in the book because the educational system is very uniform and children are expected to jump through every hoop. And as we’re talking about, some have weaknesses in certain areas but also what they don’t know is they have strengths, so their self-esteem suffers. So first, you want to help that child identify their strengths. As an educator, you may really be privy to that. If you’re not, you might suggest testing, neuropsych testing, to help them do that. But if you see that a child has an area of strength, you really want to fan that flame. You want to give them as much work in that arena so that they– and give them the feedback. Hey, yes you do struggle with this but wow, you really have a strength here. And if you can offer projects that play to that strength, so where there is variability or where there is flexibility in being able to say, for this project, I would like you to do it in this way so that you can, for example, use your visual spatial relations or use you’re more of an auditory learner, you’re going to do it this way, to offer them the chance to show where they’re strong. Because while you can tell them they shouldn’t feel bad, the reality is, society still stigmatizes this so much that just saying that won’t help. But showing them, by allowing them to blossom in the areas where they have the ability and to fan the flame of their passion where they will then continue to repeat something and get better at it, that’s, as an educator, what you can really do. SPEAKER 1: OK, Rene, thanks for calling. SPEAKER 3: Thank you so much. SPEAKER 1: You’re welcome. Let’s go– a lot of people interested– let’s go to Chris in Florida. Hi, Chris. Welcome to Science Friday. SPEAKER 4: Good afternoon, thank you for taking my call. SPEAKER 1: You’re welcome. Go ahead. SPEAKER 4: Yeah, I just wanted to make a comment when I heard your guest speak about a physician that was able to spot x-rays and had a learning disability related to dyslexia. I can share a common thread in that my background is in mechanical engineering. And I guess my gift, looking back to my career, has been able to troubleshoot machinery that other mechanics and other engineers struggle with. So I can basically take apart the machine and figure out what went wrong much, much easier and much more readily than the average mechanic and the average engineer. SPEAKER 1: And why is that? SPEAKER 4: That’s really kind of helped me in my career. SPEAKER 1: Is that because you have dyslexia? SPEAKER 4: Yeah, I was diagnosed in fourth grade with dyslexia and got after school help to help overcome that. And even today, you know, when I’m really tired, it’ll kind of come back to me. I’ll transpose a number– if you give me a phone number over the phone, I may do the 6-9 and go 9-6. But generally, I’ve kind of overcome it. But people think about learning disabilities, and in particular dyslexia, as a handicap. It’s actually been a bonus for me. It’s excelled in my career as a mechanical engineer. It probably drifted my mind and my thoughts more towards math and science but it’s resulted in a very rewarding and helpful career. SPEAKER 1: Thank you, Chris. SPEAKER 2: It’s a common story. It’s just that people aren’t usually talking about it. And it brings up an important point, which is you do want to treat people or help them develop the work arounds for the thing that is the relative weakness for them. So I don’t want to minimize the importance of that, that he was taught methods to cope with so that he could function in the world. And sometimes it still is a problem but for the most part he’s developed these work arounds. But if you get treatment or work around, it does not diminish the strength. SPEAKER 1: That’s my question. SPEAKER 2: That’s the important thing. SPEAKER 1: I mean, if you give medication to people, do they not want it because they realize they’re more creative? SPEAKER 2: So in the arena where that tends to happen the most is in bipolar disorder, where people who recognize that when they’re hypomanic on the elevated side, they are highly creative. And they’re right, by the way. That is the time they are highly creative and highly productive, they’re afraid to take medication because they think it will ruin that. And what I would say to them is this in speaking with all of the experts, while it might take it down 5%, it still will be better than normal, let’s say. And it’s more important to maintain a stable trajectory because no one stays hypomanic. They either become manic, psychotic or very depressed. And those two states, you cannot take your creativity and bring it to fruition. So it is important and it doesn’t rob you of the creativity. It might just take the very tippy, tippy peak out. SPEAKER 1: If other psychiatrists adopt your philosophy and look at these as brain differences, is it going to change the way that they treat their patients? SPEAKER 2: I think that only slightly. I think most psychiatrists, look, of course someone comes in with a problem. They’re there to treat that problem. And I agree with that. But I do think it will change the view of a patient. And I think that is important. I think it’s important for society where we’re still stigmatizing and keeping people from getting treatment in that way. But I think that if a clinician can help a patient to identify their strengths in addition to treating their weaknesses, that changes that person’s life. That will help that person to find vocation, to find pleasure, to find self-esteem because it’s very hard when someone comes in for treatment to help them with the portion of this that is about feeling abnormal or bad. SPEAKER 1: Mm-hmm. Talking with Gail Saltz author of The Power of Different: The Link Between Disorder and Genius on Science Friday from PRI, Public Radio International. A lot of folks want to get in on the conversation. Let’s stay in Florida to Jacksonville, go to Sarah. Hi, Sarah. SPEAKER 5: First time caller, long time listener. SPEAKER 1: First time, long time. All right. Go ahead. SPEAKER 5: My question for Gail is– well, let me start let me start over. I’m a graphic designer. Been in the industry for many years. And one of the things I’ve noticed is that my creativity started very early and I have the ability to notice the variances, the very small detailed variances in the color spectrum. And I’m able to put them into order. I’ve taken those test before and I score very high on that, as well as, for example I can notice when things are off by a few pixels when you blow it out to several hundred percent. Yeah. I also probably should mention at this point that I do live with OCD and anxiety disorder. And my question for Gail is should I owe my thanks to my creative abilities to those disorders? SPEAKER 2: So that’s understandable and an excellent question. And this is what I would say. What I found is that people with anxiety disorders and OCD being in there have incredible attention detail. They are what is called hyper-vigilant, for all the good of that and all the bad of that. So obviously, if you are scanning every everything for everything and it might be a warning signal or a danger signal, on the downside, you’re anxious a lot and you are perfectionistic and you can feel badly about what you can’t– anything that gets in your way, as it were. On the up side, yes. People, often with anxiety disorders, are super competent in terms of this hyper-vigilance, really do see nuance, see it coming from far away, are vigilant not only about details like you’re describing in terms of color spectrum but also emotionally vigilant. See in other people when something is coming down the pike emotionally and are able to sort of step in and circumvent something that’s coming along in the arena you’re talking about but also in relationships. SPEAKER 2: Might that have contributed, yes. It really might contribute. Now, I would tell you that when you are on the high end of anxiety or OCD, you should absolutely treat that because there’s a sweet spot of– you’ve heard a performance anxiety, right? Athletes who do the best when they are somewhat anxious. SPEAKER 1: What kind of treatment are you talking about? SPEAKER 2: So for both anxiety disorders and OCD, various forms of cognitive behavioral therapy, exposure therapy are extremely useful, work very well. Some people, for whom you know they’re really suffering and it’s very difficult, might benefit from added medication. But some people can do well with therapy alone. And for some people, even a psychodynamic psychotherapy can be helpful in anxiety disorders. SPEAKER 1: One last question, we’ve got about a minute ago, what do you think about getting rid of these categories altogether in the DSM? Throwing away the DSM. SPEAKER 2: So I think we continue to need a language, just because of culturally the way our system is set up. But what I do think is that at some point we will be getting rid of the DSM but it will be replaced by something else, something that is more symptom-based and more neurologically-based. So we will start to, this Connectome project which is wrapping up and looking at 12,000 normal brains under MRI, is going to have a lot to say about variation and I think it will help us recategorize. SPEAKER 1: Gail Saltz, author of The Power of Different: The Link Between Disorder and Genius. Great, great book. Thank you for taking time to be with us today. SPEAKER 2: Thank you so much for having me. Many experts say the DSM's approach to mental illness is outdated, and it's time to move on. Author Siddhartha Mukherjee outlines his family's genetic history with mental illness.